This Research in Action article was provided to Live Science in partnership with the National Science Foundation. To improve the quality of pollinator data available to researchers and policymakers, NSF-funded researchers spearheaded the digitization and consolidation of specimen records from 10 North American bee collections. In just three years, the Digital Bee Collection Network (DBCN) has grown to more than 1 million bee records and is one of the largest sources of quantitative data available on North American bees. Such a resource is critical to understanding the issues facing pollinators. “Issues such as colony collapse, which affects honey bees, are controversial topics. We need historical baseline data, as well as reliable current data, to address bee declines,” says principal investigator John Ascher, formerly a research scientist with the American Natural History Museum (ANHM) and now working at the National University of Singapore. Ascher and Jerome Rozen of ANHM digitized specimen records using software called Arthropod Easy Capture (AEC) — a data capture tool created by ANHM curator emeritus Randall “Toby” Schuh for an NSF-funded biodiversity project. Starting with the museum’s bee collections, they tagged each specimen with a unique barcode that included details such as habitat location, date discovered and other ecological information, such as the pollinator’s favorite host plant. Researchers at Cornell University, Rutgers University, the University of California Davis and the University of Connecticut also digitized their collections using AEC software. 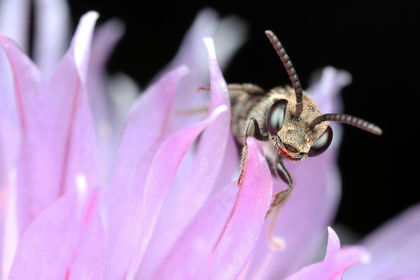 These data and additional bee databases compiled by co-principal investigator Douglas Yanega, University California Riverside, and collaborators from the USDA Bee Biology and Systematics Laboratory at Utah State University were integrated into the digital network using the biodiversity portal Discover Life (DL). As part of a broader effort to disseminate comprehensive information on the more than 20,000 known bee species, maps on the DL species pages together with millions of records from the Global BIodiversity Information Facility are available to partners such as the Encyclopedia of Life. The public can contribute data on plant-pollinator interactions to the network through a “Bee Hunt” — a citizen science project partially funded by NSF.